AleaSoft, April 2, 2019. Belgium faces a challenge similar to that of its French neighbour to replace nuclear with renewable energy without increasing CO2 emissions, but Belgium has other difficulties: it is a small country, has little renewable potential and wants to completely dispense with nuclear production. Belgium is a small country between two large electricity markets, as are France and Germany. Inevitably, its electricity market is strongly influenced by the French market, to which it is coupled between 40% and 60% of the hours, depending on the year. Being the small brother of the Belgium-France coupling, Belgium normally has prices similar or higher to those of the French market. Even so, in some years like 2016 or 2017 Belgium registered average prices slightly lower than those of France. 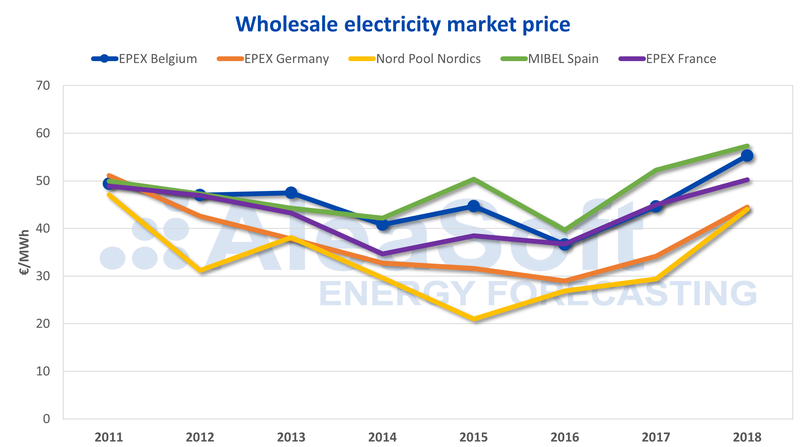 Following the trend of the main European markets, during 2018 the price of the Belgian electricity market EPEX SPOT suffered a significant rise, due to the increase in the fuel prices and the escalation of the price of CO2 emission rights. In 2018, the average price of the Belgian market was 55.27 €/MWh, which represents an increase of 24% compared to 2017 and 51% compared to 2016. During this same period, between 2016 and 2018, the price of the EUA CO2 emissions rights multiplied by five and the price of TTF gas increased by 63%. Sources: Prepared by AleaSoft using data from EEX, OMIE and Nord Pool. Belgium has few energy resources in general. It is estimated that it imports more than 75% of its total energy consumption. 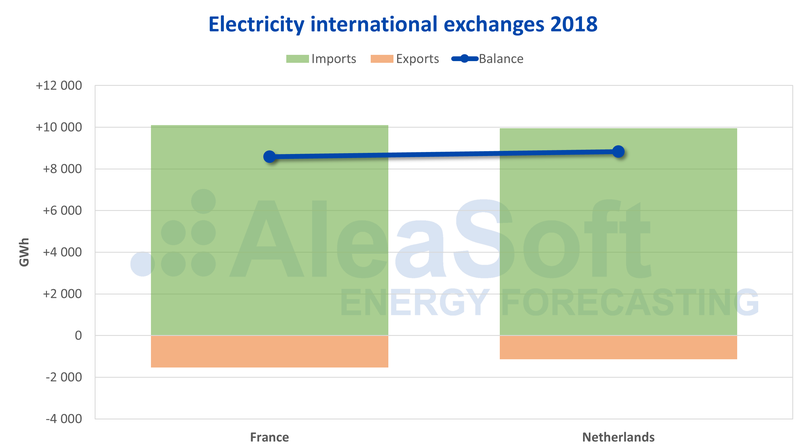 Regarding the electricity consumption, Belgium also has a clear importing balance. In 2018, a total of 20 062 GWh of electricity were imported, distributed at 50% between France and the Netherlands, which in turn imports electricity mainly from Germany and also from Norway. That year, only 2657 GWh were exported, resulting in an import balance of 17 405 GWh, which represents 20% of its electricity demand. 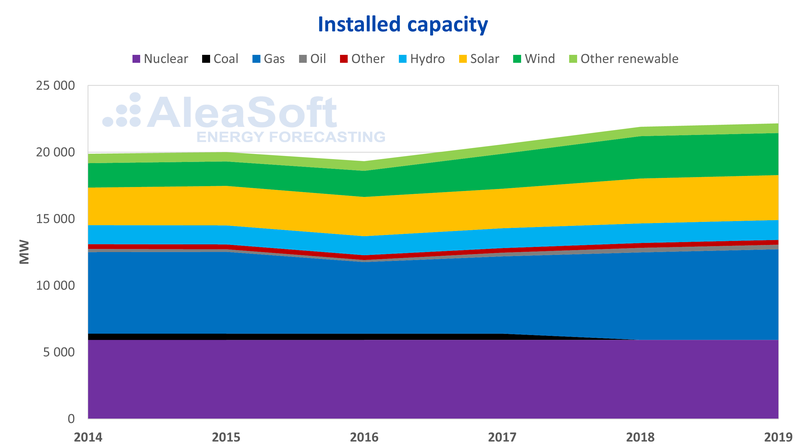 Sources: Prepared by AleaSoft using data from ELIA and ENTSO-E. The Belgian electricity production mix has two main components: nuclear and gas. The nuclear energy production, which has a total capacity of 5926 MW with its seven reactors, represents between 40% and 50% of the national electricity production and places Belgium as the fourth European country in the proportion of nuclear energy in its mix. In 2018, the nuclear energy production covered 31% of the national electricity demand. During the last year, the Belgian reactors experienced some episodes of nuclear crises, similar to those in their neighbouring French market. In November 2018, Belgium had six of its seven reactors stopped, which put the security of the supply in the country in serious danger, because of the risk of a possible cold wave during the winter, and skyrocketed the prices with peaks of around 500 €/MWh, which were transmitted in a lesser magnitude to the rest of the connected European markets. The production of electricity with gas combined cycles is the other pillar of the Belgian system. With a capacity of 6812 MW, it represents 31% of the country’s total capacity. With this capacity, production with gas represents around 30% of the total electricity production and covers approximately 25% of the national demand. Precisely the imports of natural gas are one of the main culprits of the high external energy dependence of the country. Belgium has a renewable capacity of 8733 MW, which represents 39% of the installed capacity. 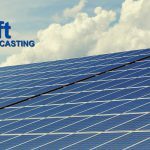 The main renewable technologies are solar photovoltaic and wind energy that, practically at equal parts, represent almost 30% of the total capacity. These are followed by the hydroelectric power, with 6.7% of the national capacity. As for renewable production, in 2018 it was very close to 20% of all the electricity produced, covering 16% of the national demand. Wind energy is the renewable technology with more production, almost twice as much as the solar photovoltaic despite having practically the same installed capacity. Belgium is a pioneer in Europe in terms of the electricity storage connected to the transmission network. The Belgian electricity system has a battery installation of 18 MW, with a higher response speed than the thermal power plants. Although the capacity of this installation does not allow yet to talk about energy storage on a large scale at the medium or long term, it is used to stabilize the network against frequency or voltage changes. Belgium was the first European country to completely abandon coal-fired power plants. The 2000 MW of thermal power that produced 11% of the electricity began to close in 2010, closing the last 470 MW in 2016. 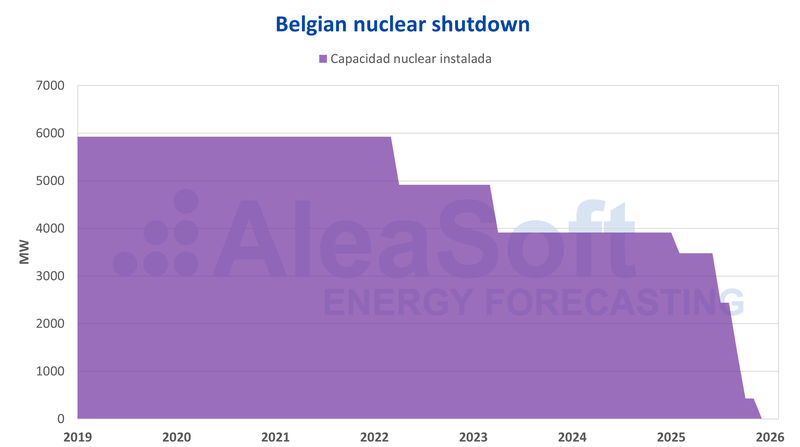 Belgium’s National Plan of Energy and Climate also includes a nuclear shutdown in the country. In fact, the shutting down of the two nuclear power plants that house the seven reactors was already foreseen in a 2003 law and it is already significantly behind schedule. The current plans foresee shutting down the last reactor by the end of 2025. The shutting down of all nuclear power plants will leave Belgium without its main source of electricity generation. The strategy to compensate this closure has three main axes: the increase of the energy efficiency to reduce the demand for electricity, the increase of the interconnections to guarantee security of supply and the increase of the renewable production to reduce greenhouse gas emissions. Sources: Belgian National Plan of Energy and Climate. Increasing the international exchanges capacity is vital for a country like Belgium: small and with few domestic resources, that must import a lot. At the end of January, a new interconnection with Great Britain with a capacity of 1 GW came into operation, and it is expected that the first direct interconnection with Germany will also start operating by 2020, also with a capacity of 1 GW. 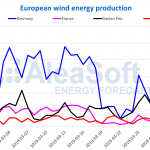 On the other hand, the capacity of the current interconnection with France is planned to increase with an additional 1 GW in 2022. If all this is achieved, in a few years the total interconnection capacity with Belgium will have been almost doubled, which will allow much more electricity importation, inevitably leading to greater dependence on imports and a lower energy sovereignty. Regarding the increase of the renewable production, Belgium has the handicap of having a relatively low potential for renewable energy. The country is quite flat, densely populated and with little solar resource. Hydroelectric reservoirs, onshore wind energy farms and solar energy plants are solutions with little potential, because there is not enough space available. That is why the great renewable bet of Belgium aims to the development of offshore wind energy. On the other hand, the promotion of self-consumption is one of the few viable solutions to increase the photovoltaic capacity. 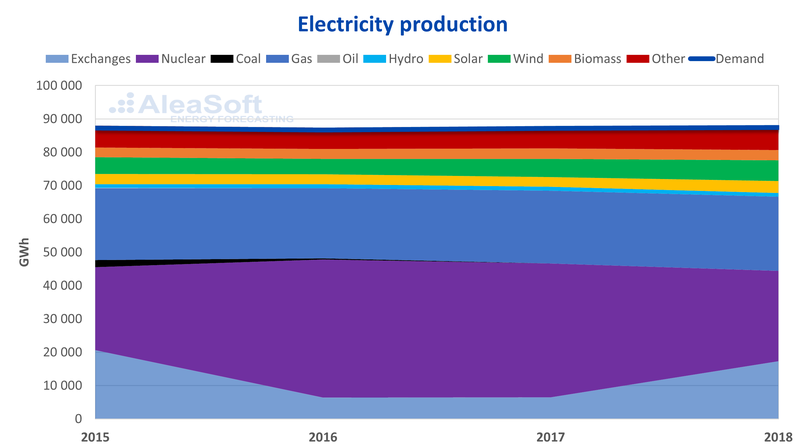 But the increase of the renewable capacity, together with the disappearance of the nuclear base production, leads to a more intensive use of backup power. In this case, it will be the gas who will play this role and, as it happens to its French neighbour, it will be a challenge to reduce CO2 emissions in a scenario with more gas and less nuclear. Collaterally, this will also imply an increase of the needs for gas imports, which will further increase the dependence on foreign energy. The estimates of the National Plan of Energy and Climate indicate that the country’s needs for energy imports will increase to 90% in 2040, compared to the current 75%.